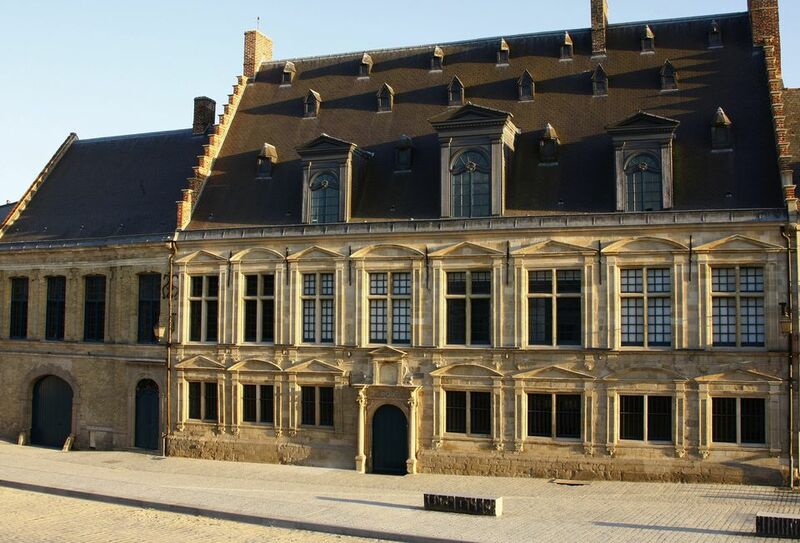 One of the most charming towns in Nord Pas-de-Calais, now part of the new Les Hauts de France region of northern France, Cassel is perched on the top of Mount Cassel, making it the highest point in the flat surrounding landscape of Flanders. It has the Museum of Flanders, a delightful Grand’Place that is not quite so grand as in the great cities of Brussels and Bruges, narrow winding streets, a windmill, good hotels and a delightful local estaminet (Flemish bistro) to eat in. By car from Calais. Take the A16 north signposted to Dunkirk and Ostend. At exit 52, take the D11 signposted to Cassel. Originally an 18th-century chateau, this delightful hotel has quite a history. It belonged to a former Mayor of Cassel who met an unfortunate death at the guillotine in the French Revolution. It was also the place where Marshal Foch stayed for 8 months in World War I, and where George V of England and a posse of aristocrats stayed briefly in 1917 and 1918. Each room has a different theme, and is very well done without the touch of kitsch which might so easily happen. I’ve stayed in the predominantly pink, La Vie en Rose, complete with wind-up gramophone and 78 vinyls on the windowsill, and in a little cottage room outside the main hotel looking out onto a gypsy caravan (another room), and a magnificent view beyond the gardens. Both were lovely, with well-equipped bathrooms. The view from the dining room is equally spectacular. The spa next door is owned and run by the hotel. Read guest reviews, compare prices and book the Chatellerie de Shoebeque with TripAdvisor. Owned by the Chatellerie de Schoebeque, this is a house with five rooms to let on a bed and breakfast basis. It’s about a ten-minute walk from the hotel, but it’s pretty steep so you might prefer to drive between the two. It’s a very reasonable alternative, and you can take breakfast up the hill at the more expensive hotel and get the great view. This hotel that fronts onto the Grand’Place offers six fairly standard but comfortable rooms, along with a restaurant specializing in regional products. Read guest reviews, compare prices and book the Hotel Restaurant Le Foch with TripAdvisor. A welcoming, authentic estaminet serving good beers and a great range of typical Flemish dishes, this charming place is up the hill near the windmill. You can drive, or walk here for excellent food at very reasonable prices It’s full of old furniture and decorated with hop flowers; there’s a roaring fire in winter and traditional games to play. It also has a small shop stuffed full of regional products. A three-course meal is around 30 euros per person. Robust Flemish cooking in this old Flanders tavern on the Grand’Place. And there’s a terrace with a great view for summer dining. A three-course meal is around 20 euros per person. Buzzing and welcoming, this popular restaurant is another place for good regional specialities. Again, there’s a terrace with great views in the summer. Re-opened in October 2010 after 13 years of renovations, the museum shows the depth and richness of the culture and art of this part of Flanders. It’s imaginatively displayed in old wood-panelled rooms, and has some real gems of paintings. The windmill is the only survivor of the 20 or so local windmills that took advantage of Cassel’s elevated position and produced flour from locally grown corn and rye. It replaces the old 16th-century wooden windmill destroyed by fire in 1911. Climb up the winding rickety steps for a great view over this part of northern France and be rewarded with a bag of flour. Also up here you’ll see the statue of Marshal Foch on his horse, commemorating the World War I leaders’ visit here. Admission Adult 3 euros, child 6 to 14 years old 2.50 euros. Inspired by paintings of the Old Masters, the Garden is really several gardens. Each part of the garden is themed, from the Renaissance style with its topiary cut from yew trees, through a traditional orchard and kitchen garden, to a contemporary garden with different topiary styles. Spaces in the hedges give you different views of the landscape. Cockerels crow; handsome chickens with plumes of feathers scratch for food and a cat stretches lazily on the warm paving stones outside the front door. It really does look like a fairytale and is rightly classified as a Jardin Remarkable by the French authorities. It’s in the same ownership of the ‘T Kasteelhof estaminet and shows the same sensitivity to the past as the excellent restaurant. Open mid April to mid November, Tuesday to Sunday 10am-7pm. Closed 1st week of July and 1st fortnight of October. Admission Adult 5 euros, free for accompanied children under 15 years old. For more information on Nord-Pas-de-Calais region, go to the Nord website.